Vestibular disorders can develop when the vision, touch and/or inner ear systems that achieve balance are disrupted. Our treatments can alleviate problems affecting balance, walking, neck motion and visual stability so that function improves and the risk of falling decreases. Children with vestibular disorders often have different symptoms than adults, which is why it’s important for your child to see a pediatric specialist as soon as symptoms begin. Treatment can be as brief as two visits or as long as several months, depending on the severity of the disorder. Our vestibular rehabilitation team includes pediatric audiologists and rehab therapists with special training in vestibular evaluation and therapy. Your child may not need to see both specialists. Our rehab therapists perform a comprehensive assessment that evaluates hand-eye coordination, motor control and balance. They develop comprehensive rehabilitation plans based on that information and other diagnostic testing. Our audiologists use specialized equipment to perform comprehensive evaluations. This testing helps determine which part of the balance system is causing the symptoms. Our team incorporates play and fun into treatment to help children and teens feel more comfortable and stay engaged, which promotes a positive outcome. Our specialists include the family when developing a treatment plan, incorporating exercises that can be done at home. 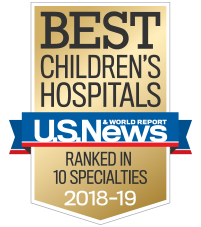 Children’s is one of the only pediatric hospital systems in the Southeast that provides vestibular rehabilitation treatment. We offer rehabilitation services at Children’s Medical Office Building, Children’s at Alpharetta Highway, and Children’s at Fayette. Call 404-785-7100 for more information or to set up an appointment.